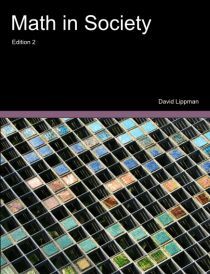 This book is a survey of contemporary mathematical topics, most non-algebraic, appropriate for a college-level quantitative literacy topics course for liberal arts majors. The text is designed so that most chapters are independent, allowing the instructor to choose a selection of topics to be covered. Emphasis is placed on the applicability of the mathematics. Core material for each topic is covered in the main text, with additional depth available through exploration exercises appropriate for in-class, group, or individual investigation. David Lippman received his master�s degree in mathematics from Western Washington University and has been teaching at Pierce College in Lakewood, Washington since Fall 2000. David has been a long time advocate of open learning, open materials, and basically any idea that will reduce the cost of education for students. David is also the coauthor of Precalculus: An Investigation of Functions, an open and free precalculus (college algebra and trig) textbook.